The setting was absolutely delightful, the adjoining property with its incredible garden is full of charm and elegance. The apartment itself is very tastefully decorated; a sensuous yet quiet sophistication that makes you feel at ease. The owners were incredibly attentive and generous towards me, personal circumstance made this trip especially difficult for me but staying here helped to make it a restful experience when possible. I feel incredibly grateful to them for all their efforts. There isn't a single thing I feel dissatisfied with.. 10/10! I would certainly recommend to friends and family or to anyone that might want to visit the area. The house is so central yet its quiet location shelters you from the hustle and bustle of this dynamic town. L’accueil chaleureux, la beauté et le style de l’appartement. L’équipment et la propreté des lieux. J ai adoré mon séjour! La propriétaire est super gentille. Le lit était très confortable. Le décors de la chambre est beau et du très bon goût! Sur la table, il y avait même <Besançon Littéraire> pour m'aider de connaître mieux cette ville. Merci d'avoir passé votre machine à laver pour mes linges sales. Cela m'a aidée vraiment beaucoup! Tout est parfait, l'appartement est spacieux et décoré avec goût. Entièrement équipé il ne manque rien, nous reviendrons avec plaisir et nous profiterons aux beaux jours du magnifique jardin . Lock in a great price for L'adresse à Besançon – rated 10 by recent guests! Offering garden views, L'adresse à Besançon is a property located in Besançon, 4.3 miles from Micropolis and 1.2 miles from Museum of Fine Arts and Archaeology of Besancon. Guests staying at this apartment can use the free WiFi and terrace. The apartment includes 1 bedroom and a living room with a flat-screen TV. The apartment also has a fully equipped kitchen and a bathroom with shower. The apartment has a grill. A children's playground is also available at the property, while guests can also relax in the garden. Saint-Jean Cathedral Besançon is 2.1 miles from L'adresse à Besançon, while Time museum of Besançon is 2.1 miles away. The nearest airport is Tavaux Airport, 40 miles from the property. When would you like to stay at L'adresse à Besançon? You will be accueilli.e.s in a house of the 18th century in a self-contained flat and beam. In the courtyard, in the interior enclosure of the house, you will be able to station your vehicle. On the garden side, in a park of 24 ares, you will be able to settle at various places to benefit from the exceptional framework of the property, made up by species varied centenaries and plants. Structured around a part with living, of a room and a shower room with shower with Italian, the apartment of 34 m ² was renovated in the respect of the history of the residence. Material comfort and at the same time modern and cordial environment will make your stay one pleasant moment, favourable with the relaxation. The young children will be welcome and a bed soft will be booked with small. According to your needs and desires, the good addresses and local activities will be recommended to you. You will be able to settle in the park, to lunch or dine in the garden and to forget in the quietude of the places that you are located downtown full! 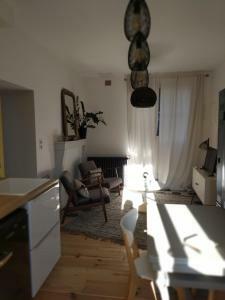 The apartment is ideally located within walking distance from the Viotte Station at BESANCON. Within the district of Chaprais, you will reach all the trade of proximity (supermarket, hairdresser, press,…) and at greedy addresses (butcher's and pork butcher's shop, restaurants, delicatessen…). With less than 10 minutes on foot, you will reach the theatre, the museum of contemporary art, the Tourist office located in park MICAUD along banks of Doubs, Eurovélo6 and the Besancon-native centre town where many visits will be offered to you. You will be able to also take the tram to return to you to various places of the city. Here, all will be mobilized so that your stay answers your waitings as well as possible. House Rules L'adresse à Besançon takes special requests – add in the next step! Please inform L'adresse à Besançon of your expected arrival time in advance. You can use the Special Requests box when booking, or contact the property directly using the contact details in your confirmation.